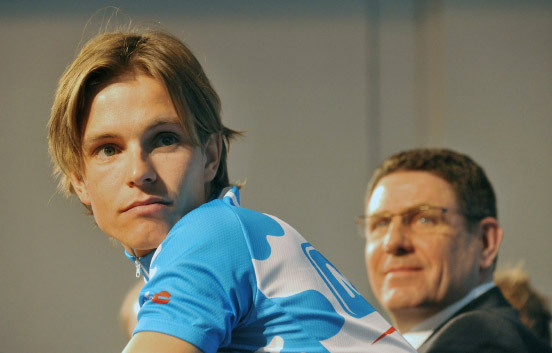 Being a Barbie collector as well as a cycling fan, once I learned Haussler's nickname it was instantly crystal clear that the world needs a Barbie Barbie. This page chronicles my attempt to create one. 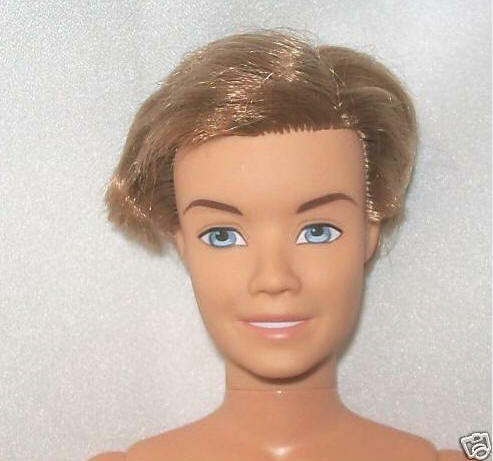 Wait a second--don't you mean "Barbie Ken"? 3. 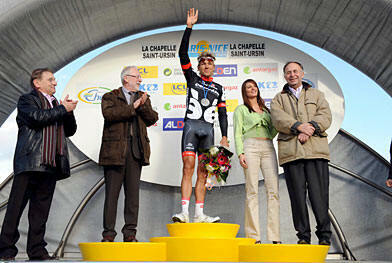 Appropriate accessories: helmet, sunglasses, shoes, bike. Flowers and champagne bottle if I'm going to pose him on the podium. Possible, but I think I can do better, and will keep looking. Because of the scale, it's clear that I won't be able to do the finer bits of the design and small lettering. I'm just not that good! Saturday, September 5. Shopping for dye. I go to Michael's craft shop over at Trader's Point and consider options. My first thought is to dye the wetsuit black with Rit dye and get white and red fabric paint for the design. But Rit costs $6.49 and I'd only use a little bit of it, while a bottle of fabric paint is $1.69. 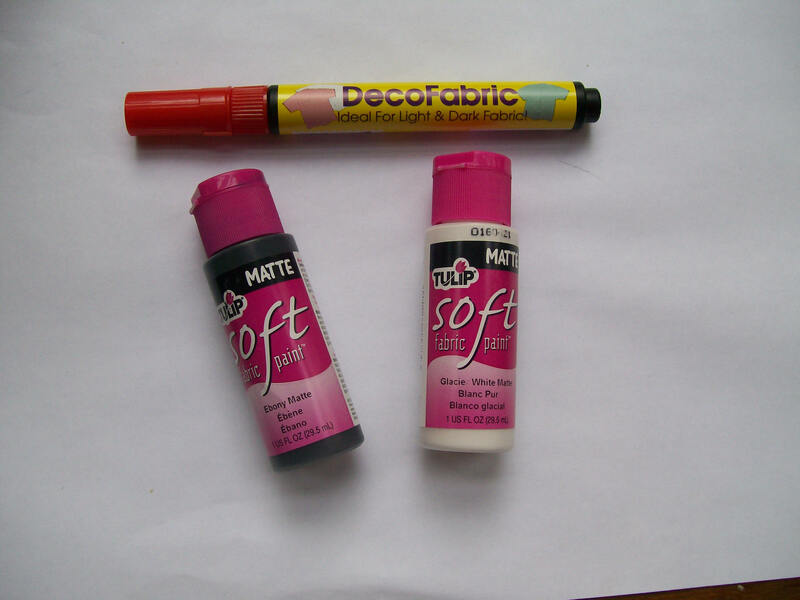 So I end up with a bottle of black fabric paint, a bottle of white, and a red fabric paint pen. 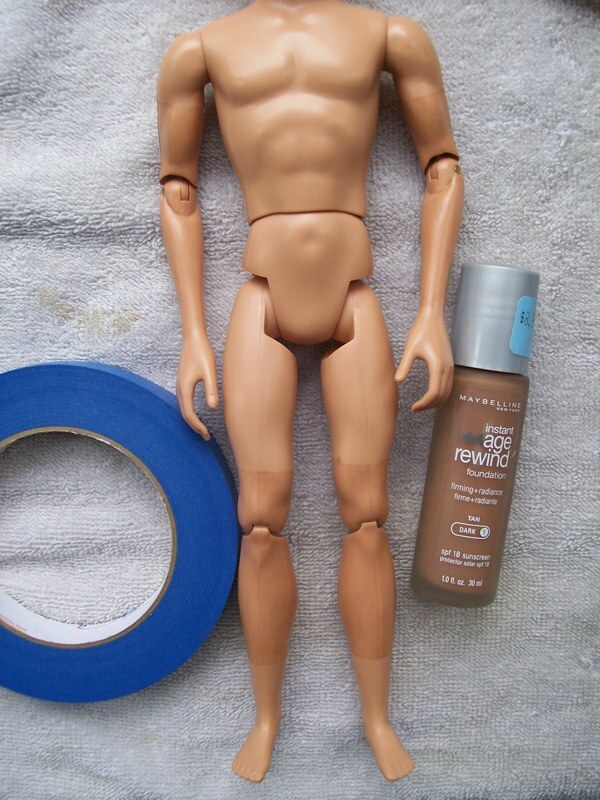 I don't want the black paint to stain whichever Ken I end up using for Barbie Barbie, so per the directions I'm going to wait 72 hours and wash the pieces. If the paint holds as is, great. If not, I'll do another coat, wait three more days, and wash them again. If it's still not staying black after a second coat, I'll reconsider then. 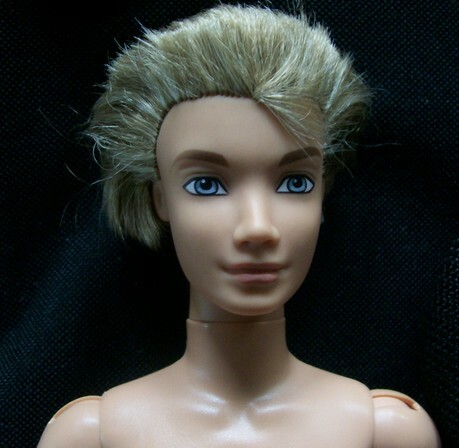 In the meantime, the search for a better Ken continues. Blurry shot, but the hair looks spiky. This one looks like it would work--hair is short in front and could be spiked. Will be near a Toys R Us today and will see if either doll is available there. Okay, back from TRU. 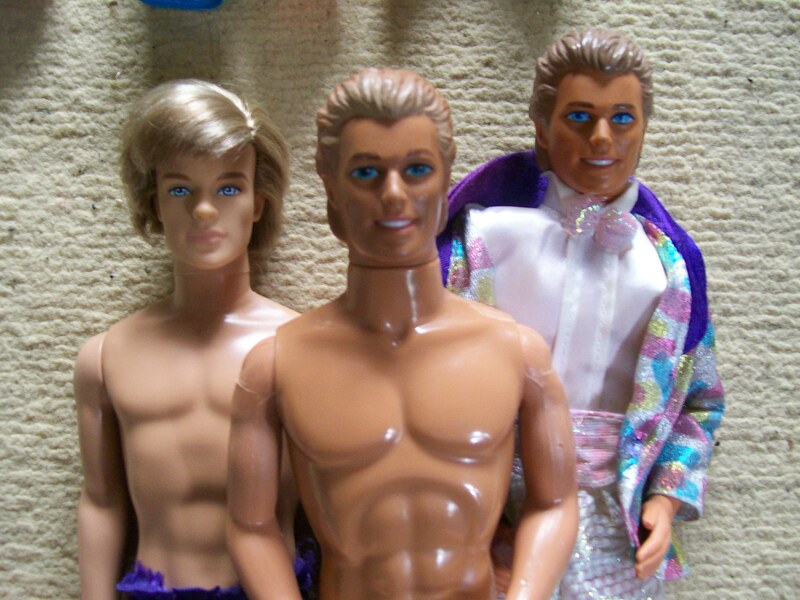 No suitable Kens, so I might have to bid on one or both of the above. Hmm...may have to invest in some Milram-blue fabric paint next! Friday, September 11--Jersey progress. Washed the kit today to see how the paint held up. Pretty well, but there is some blue fuzz apparent--shows up as shiny bits in the picture below. I think I'll thin down some paint and do a light wash over the front to see if that covers it. 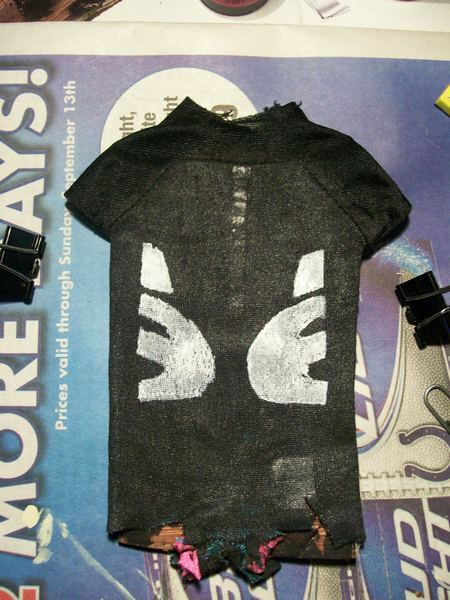 And start practicing stenciling on some trash fabric. Sunday, September 13--Scored a Ken! 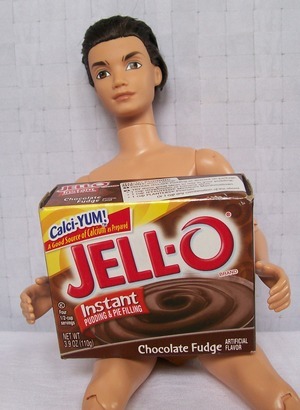 Of course, my particular doll may vary a bit.  Will post a picture when he arrives. Tuesday, September 15, 2009--Stencil tests. Okay, not as easy as I thought. 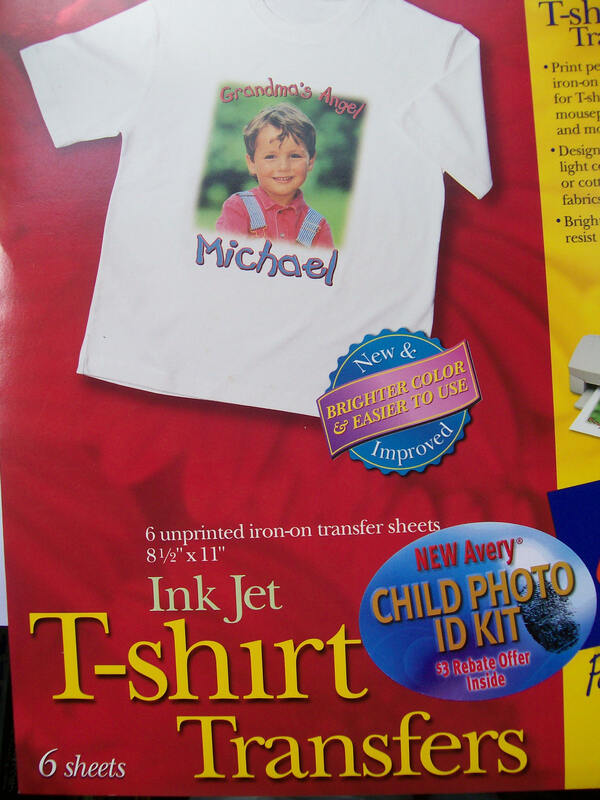 If you recall, my bright idea was to print out the kit, then use an X-Acto knife to cut out bits to make a stencil. I tried cardboard first--wasn't able to get my printer to accept it, so I printed the kit on paper to use as a pattern, glued it to the cardboard, then tried cutting. Didn't work. The cardboard was too thick to get a clean line. So I tried various other things: photo paper, plastic, card stock. 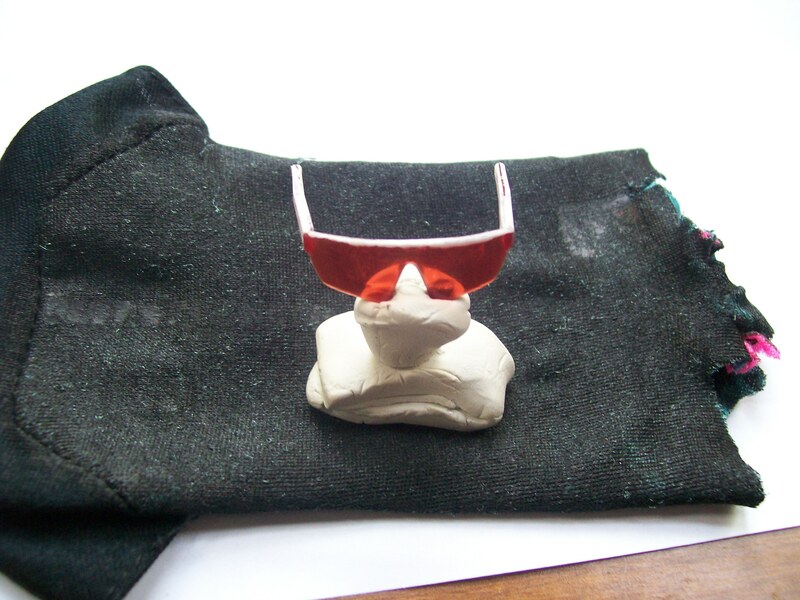 One of the things I've been pondering from the start of this project was what to do about Barbie Barbie's sunglasses. 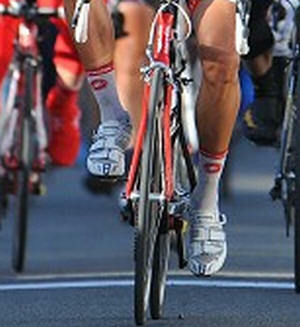 In the picture I've been using as reference, Haussler is wearing a pair with white frames and amber lenses. I have--somewhere--a couple of pair of cheap all-white Barbie sunglasses, sort of like the black ones on the doll above only solid white. I figured I could always paint in orange-brown lenses, but that they wouldn't look all that great. 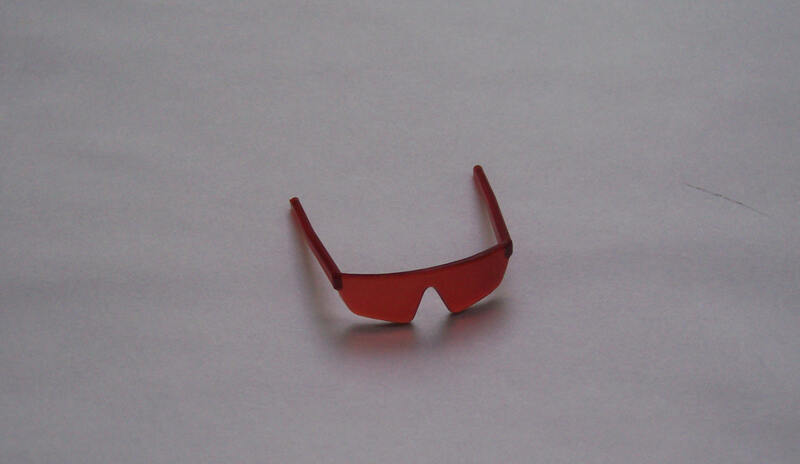 Or I could use a classic Barbie cat-eye glasses frame and paste in some lenses of the right color, but the shape would be all wrong. 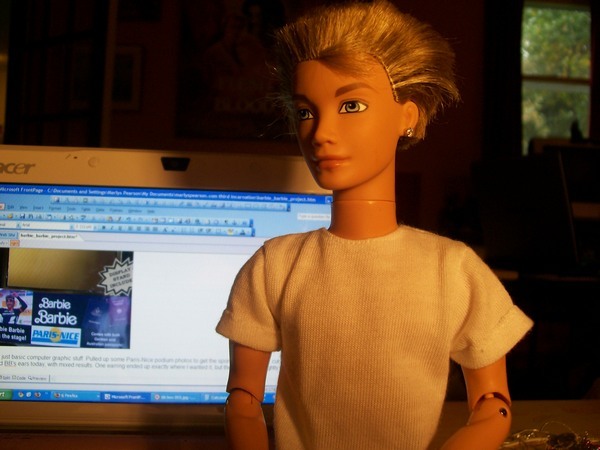 I have yet to resume work on the kit--I'm waiting for the frosted-hair Ken to arrive so I can check size. 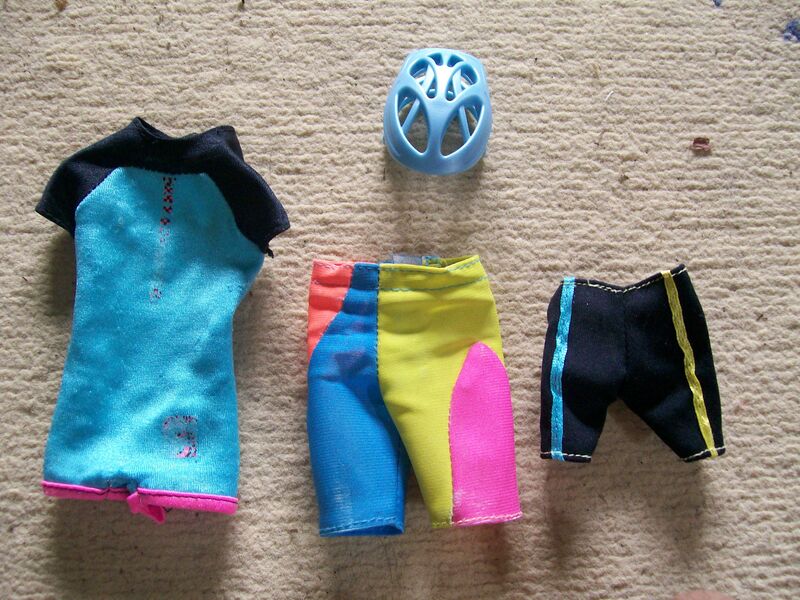 My eBay find is a My Scene Ken, which are a bit different in size from the one who donated his wetsuit to the cause, so I'm reluctant to iron on a transfer until I see how much torso I have to work with. So where is Ken???? Yes, I'm impatient. The auction ended on the 13th, not even a week ago, and the seller says she ships "within three days." That means he may not even have left California until the 16th and could easily take a few more days to get here before I have anything to moan about. Still, I won other auctions on the 14th and 15th and have already received those lots. Bah waiting. Good shape overall. Hair needs a little taming, and if I think I can pull it off I might deepen the contrast between the frosted and unfrosted parts of his hair. Kit fits his body fine--shorts are a little short, but not unreasonable. 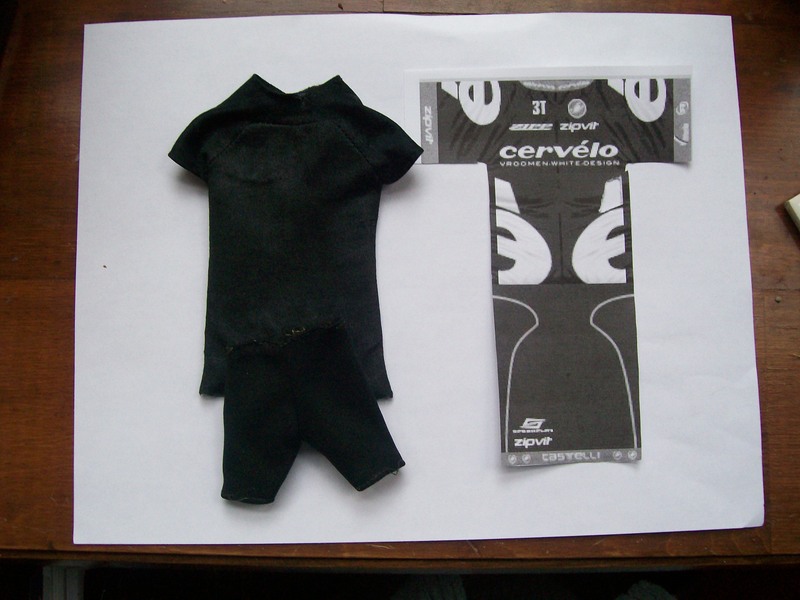 Speaking of kit, I found out today that T-shirt transfer does not work on painted lycra. Will either have to solve stencil problem...or get a white fabric paint pen and freehand it. 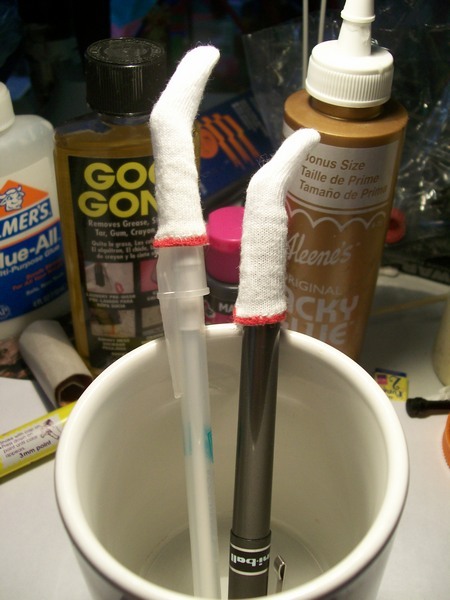 Or cut the little white bits out and glue them to the frigging kit. 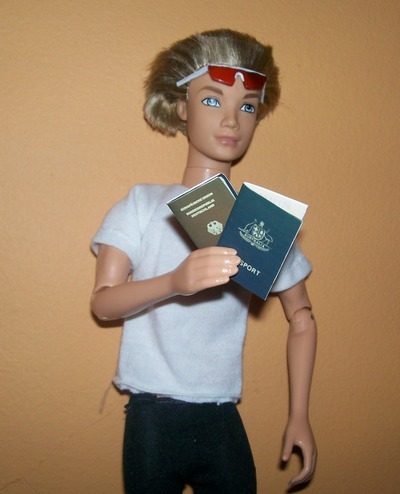 One way or another, I will have my Barbie Barbie. 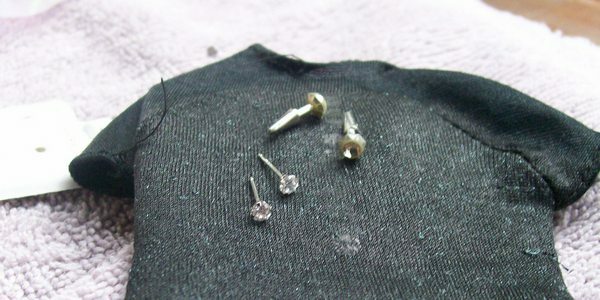 And much smaller posts, so should go into his ears quite easily. Wednesday, October 7. Worked on the box--on the other computer, so pics not available at present. Just wait. Also bought a fine-point white paint pen for lettering on kit. Thursday, October 8 They see gloves. 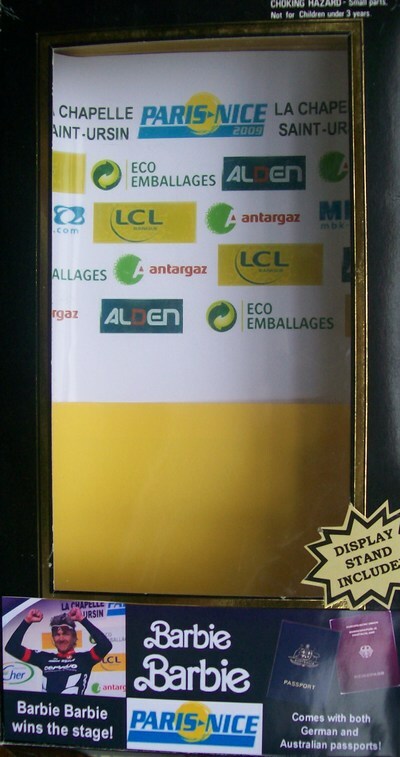 I see arm warmers. 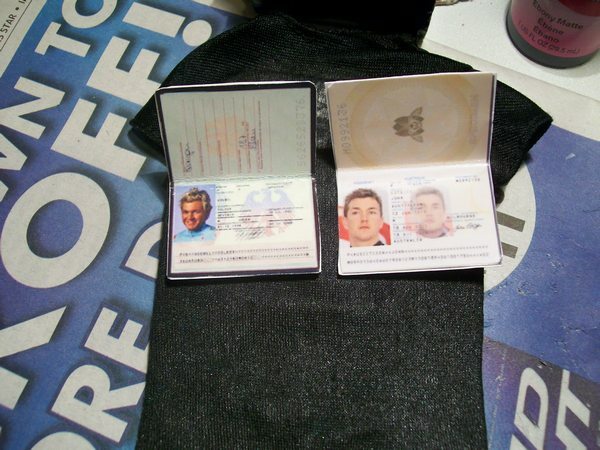 Nothing difficult about these--just Google for Aussie and Deutsch passports, right-click, paste, mess with size, add photos. I was going to alter the text to make the details match Haussler, but then I realized that once they were reduced in size it would be too small to read anyway. Had on hand: black shorts, Ken wet suit for jersey, white shoes, white socks, acrylic paint, flowers, earrings, printing supplies, empty box. Eventually, I need to get him a bike. A bit too crowded, I think. Will probably ditch the side stuff and stretch out the name a little. Once it dries, I'm going to use the pen to sharpen up some of the outside lines, and will probably use the white fabric paint to get better coverage. 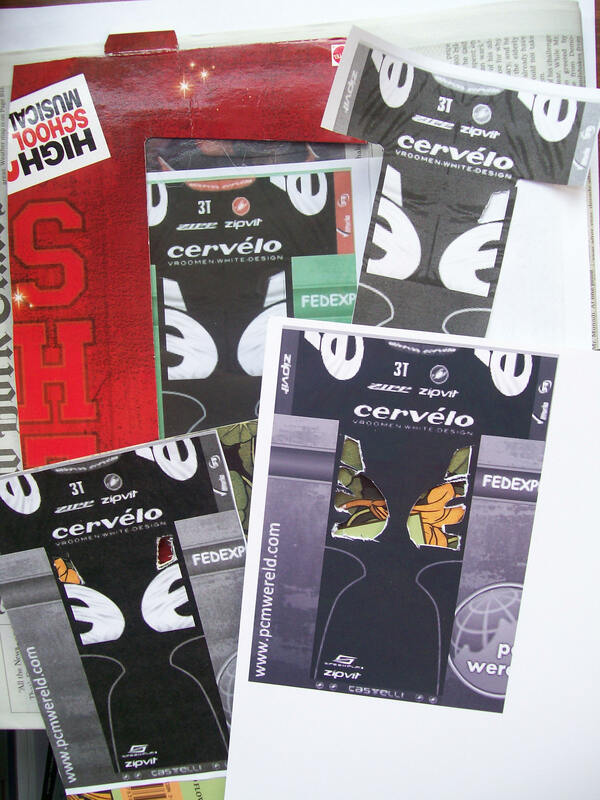 Then I'm going to hand-letter Cervelo up top and use the red fabric pen to put red bands on the sleeves and neckline. The rest of the design and lettering is too fine for me--I'd love to get that kind of detail, but it ain't gonna happen. Not only is it beyond my skill level, but when you work in small-scale stuff, too much design ends up looking busy. 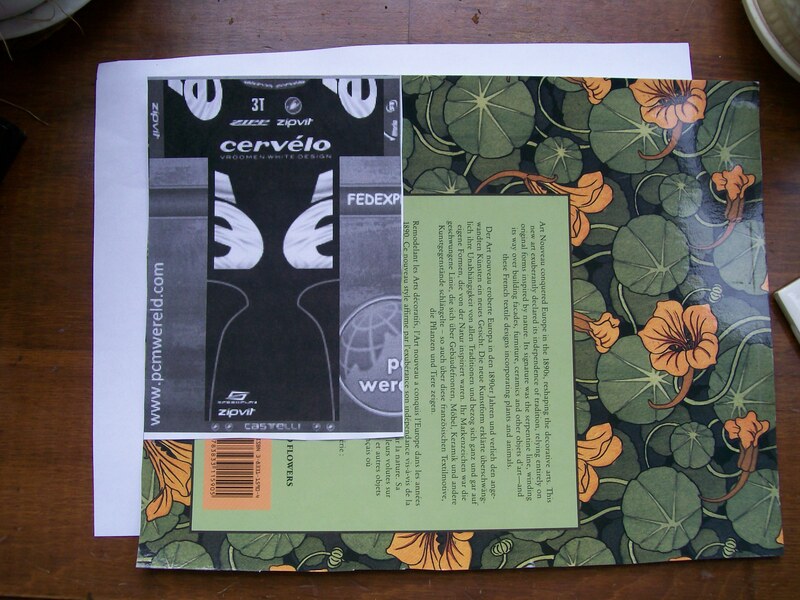 I am still considering putting the Cervelo e on the sleeves, but we'll see. 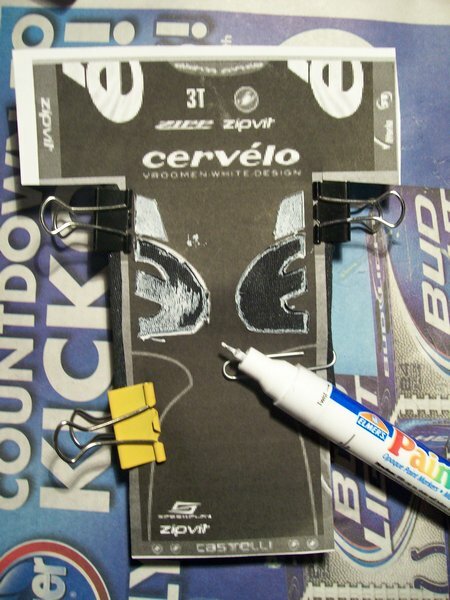 And I'll probably just cut out the Castelli scorpion and glue it on. So...moving in toward the home stretch. Barbie Barbie is almost done! Tuesday, October 13: Hand-lettering...with help. 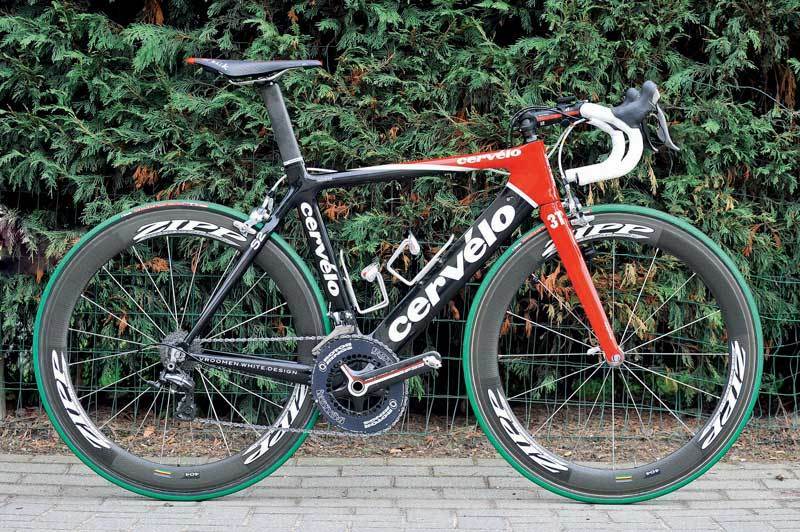 So, I practiced writing "Cervelo" a couple of times with the paint pen. But it worried me--what if I started in the wrong place, or made the letters too big or too small, so that the word ended up off-center? The text on the pattern I'd printed out was too small to cut out and use as a stencil. What was I going to do? Inspiration hit. What if I took the pattern and poked holes in the letters? I could dot paint through the holes, then connect the dots. The letters might still turn out crappy, but at least they'd be spaced correctly. And this is how it turned out...sadly, one of the many careers now closed to me is calligraphy. Okay, not much choice on the white shoes. 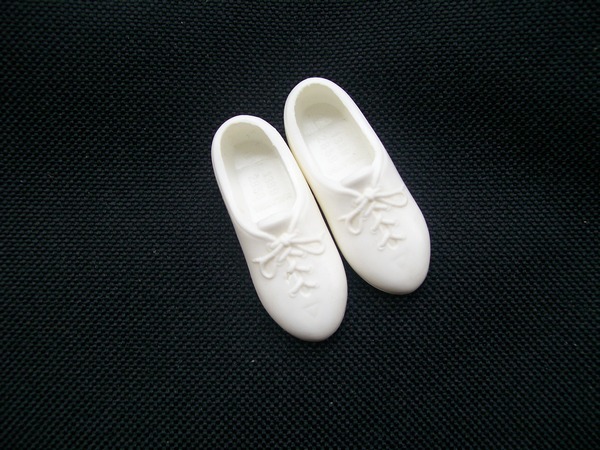 Ken has about three types of white shoes: loafers, sneakers, and lace-ups. 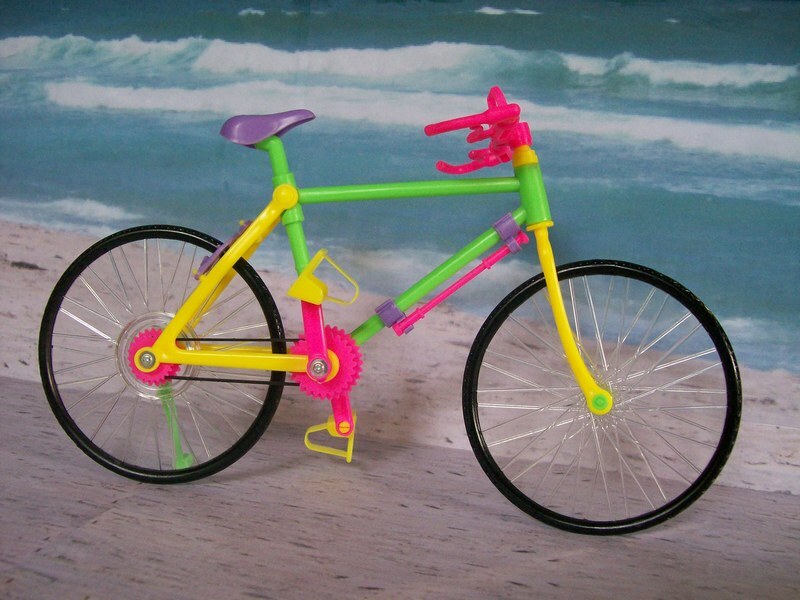 No cycling shoes with straps. These will have to do, at least for now. EDIT: The shoes below were fine on bare feet, but wouldn't go over the socks. Barbie Barbie is actually wearing loafers. The socks were a bit dingy, so are soaking. Once they're clean, I'll see about decoration. 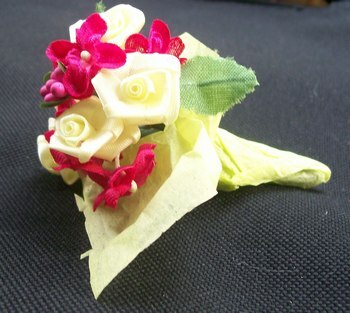 They aren't the correct flowers anyway, but hey--this whole project is an interpretation, right? Wednesday, October 14. The "arm warmers" are a bit short. 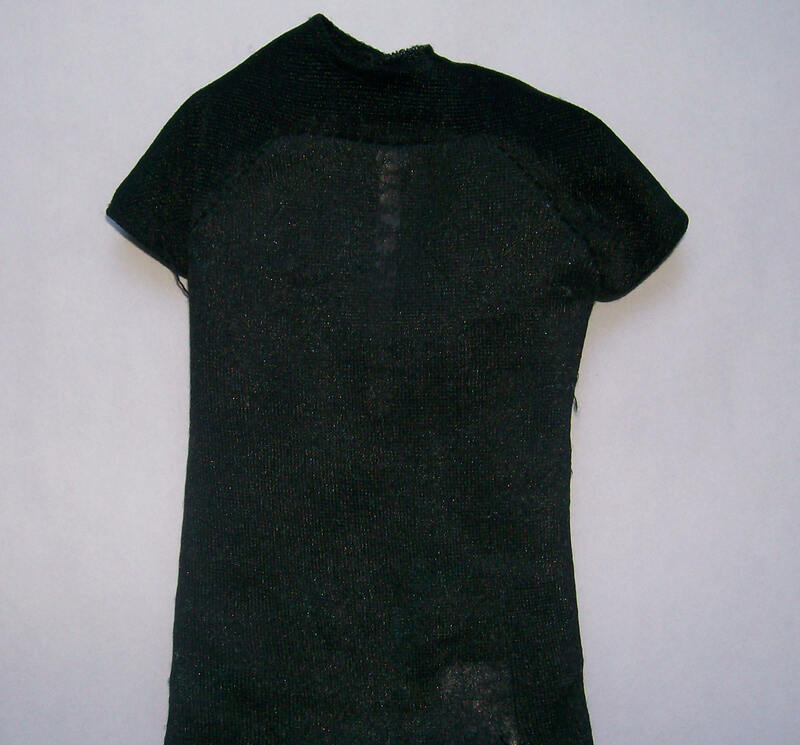 How hard could it be to sew two tubes of stretchy black fabric? 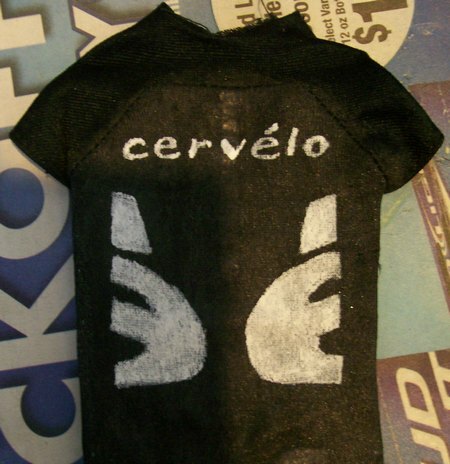 I'll either make do with short arm warmers or try to make a new pair. My black dress socks are nervous. Thursday, October 15: Introducing Barbie Barbie! 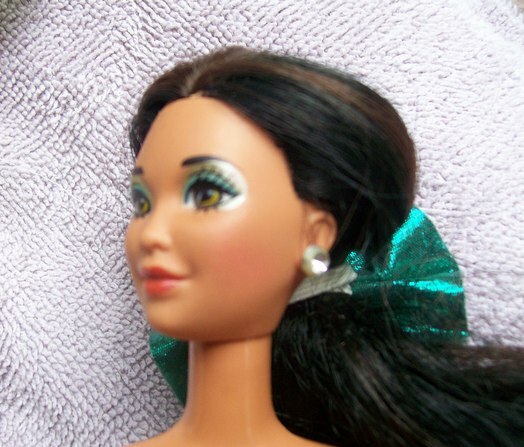 Look for Barbie Barbie's further adventures on the new page. Any craft updates will be here on the project page. Tuesday, October 20: Barbie Barbie has acquired a bike Okay, it's never going to be shaped like a Cervelo. But at least I can paint it like one. And remove the toeclips, kickstand, and pump. Saturday, November 8 Details, details... Yes, that's a real vintage Barbie hanging out with Barbie Barbie. She's a later ponytail, from about 1963. 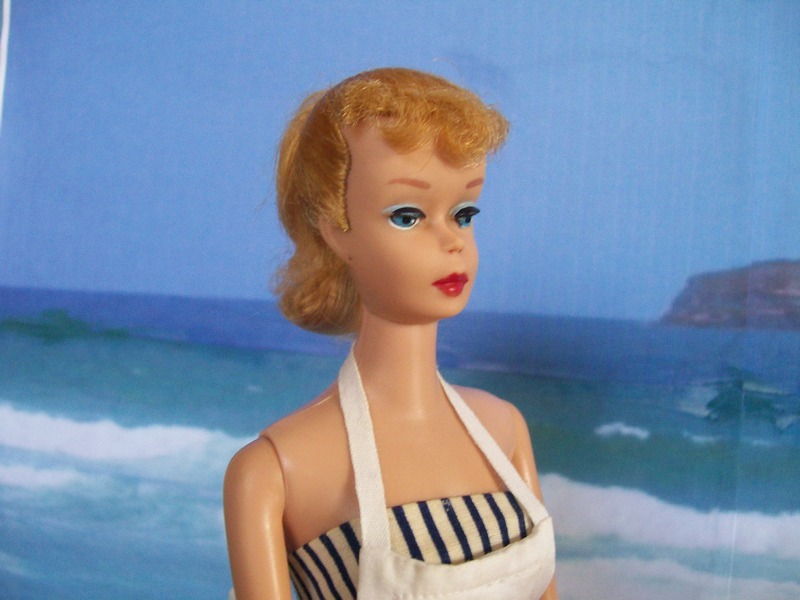 The striped dress she's wearing is called Cotton Casual (1959-62); the apron is, appropriately enough, from Barbie-Q (also 1959-62). I did leave the cooler Barbie pink, though. You can tell I don't have a gas grill--not until after I carefully painted the white gas tank metallic did I find out that most of them are white anyway. Oh, well. 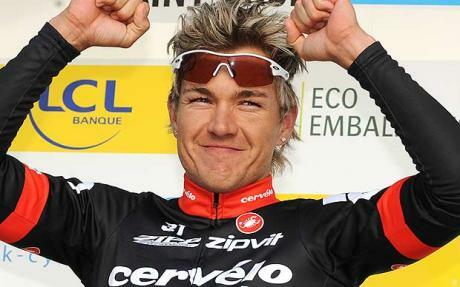 The photo background is a beach in New South Wales (where Heinrich Haussler is from), but I don't know the exact location. It's by Maryam Yahyavi--I found it on DHD Media Gallery, a collection of free-use photos and clip art. Monday, November 16: the problem of tan lines Love 'em or loathe 'em, tan lines are a fact of life in the peloton, and so Barbie Barbie needs to show them off. How to do it, though? 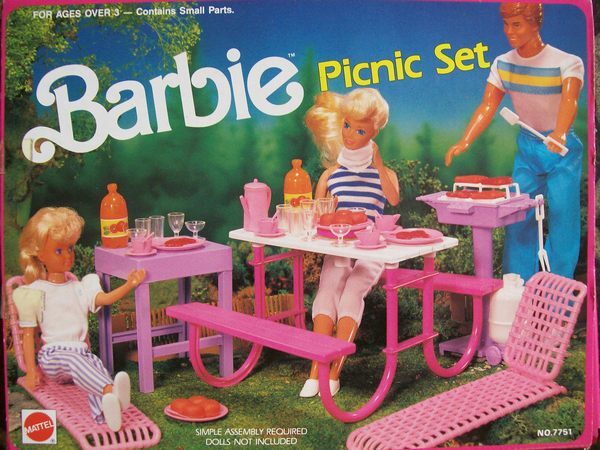 While Barbie Barbie was busy with other things, I experimented on a Barbie To Be Named Later, whose tan lines will be very appropriate in--ah, that would be telling. Hmm. They're a bit more obvious in person, but I can mess with the lighting--plus, guys from that part of Europe don't tan very dark anyway. 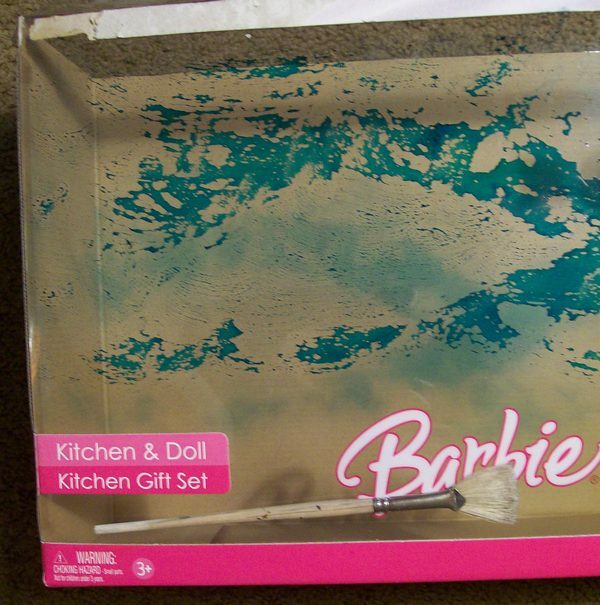 See how it turned out at The Adventures of Barbie Barbie. In person, BB's tan came out darker than the first doll's, but my camera skills aren't up to getting it to show up properly in a photo. Bah, me. Details, details... 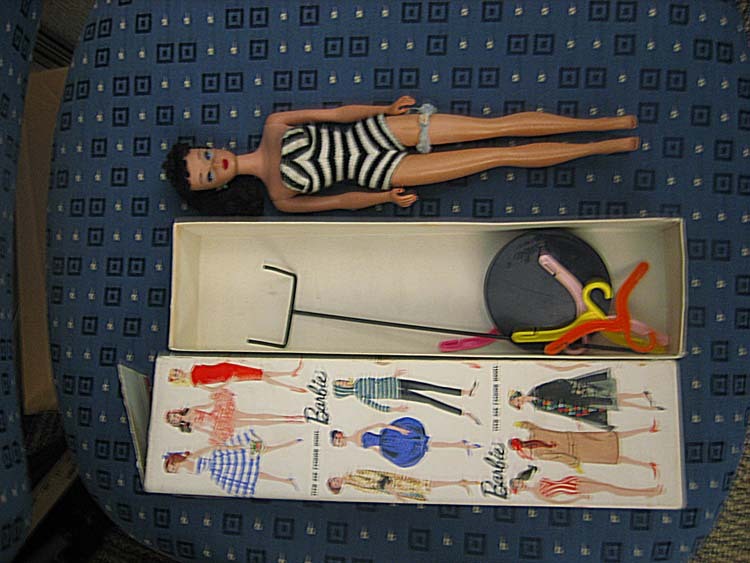 The GI Joe in the November 16 episode of Barbie Barbie is a repro I picked up at a garage sale somewhere. 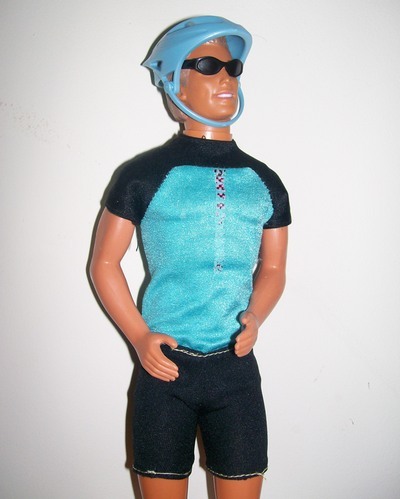 Ricco is played by Liam from Mattel's Flavas line, their flop attempt to create dolls for the hip-hop crowd back in 2003. He showed up in a mixed lot I bought on eBay, and instantly reminded me of Ricco. Then, it all just seemed too perfect: a cyclist nicknamed Cobra. 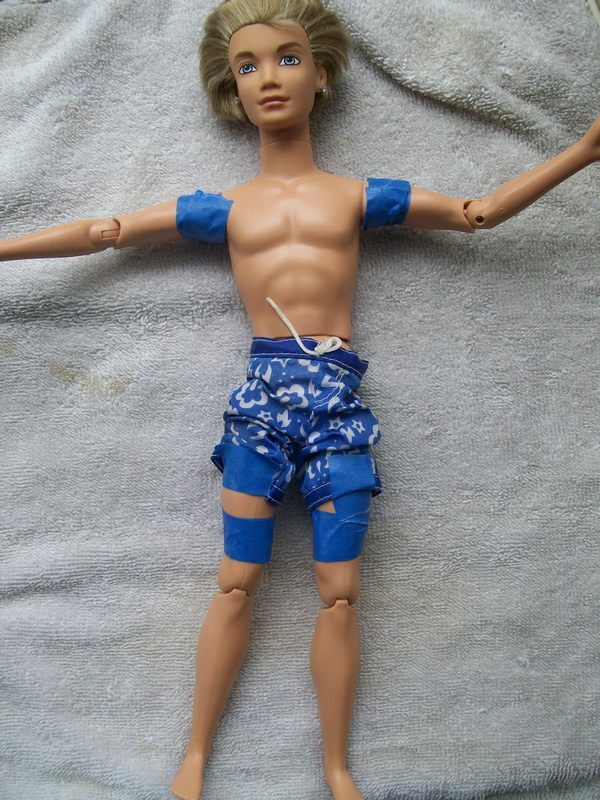 Barbie's past with GI Joe. Joe's major foe since the '80s being the Cobra organization. Sometimes things just mesh. December 3, 2009 Fins to the left, fins to the right... The main challenge this week (did I forget last week? Oops. Thanksgiving. Plus a trip to Chicago for a fan event of a very different kind...) was water. I knew I wanted to do a version of EBH's dolphin shot from this year's Amstel Curacao, but how to photograph him in the ocean? 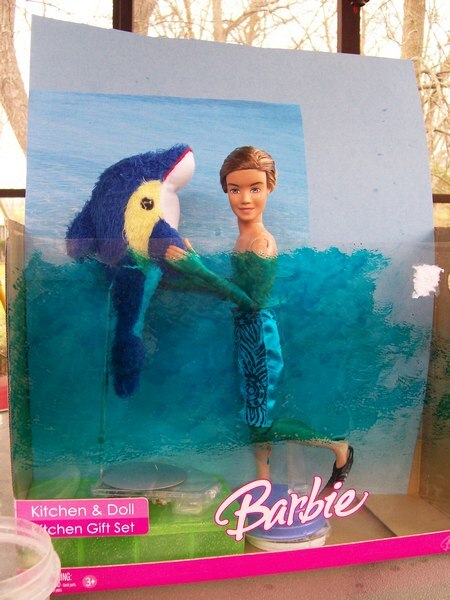 Real water wouldn't work--I mean, I could fill up the bathtub and color the water blue, but the backdrop would get soggy and so would the stuffed dolphin. I could print out or paint an ocean scene and put it in front of the figures, but I really wanted something transparent. Luckily, I just happened to have an empty box with a clear plastic front (the things I just "happen to have" would fill a house--and they do). Painting it blue, though, took some thought. 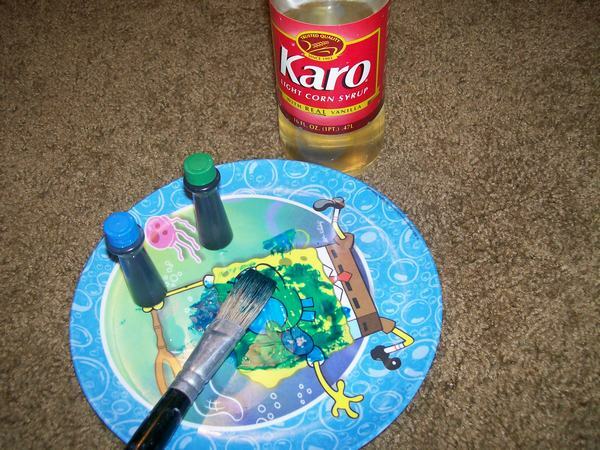 My acrylic paints are all opaque, and I wanted transparency. I tried food coloring, but of course it just beaded up on the plastic. Hmm. What I needed was something sticky and transparent to act as a medium for the color...what might I just happen to have that would work...? Note the cold, grey sky visible above the box. I shot this on my back porch to get the best available light, which on a rainy December day in Indiana isn't much. It was about 38 F, and I was barefoot. One must suffer to create. December 11, 2009: Speech bubbles and scheduling One of the ongoing problems I have with the Barbie Barbie series is adding speech bubbles to the pictures. I've tried a variety of programs with varying success--some do great bubbles but the picture turns out too small or the resolution is crappy. This week, I've gone for one that produces more primitive-looking bubbles but the size and resolution of the shots isn't too bad. 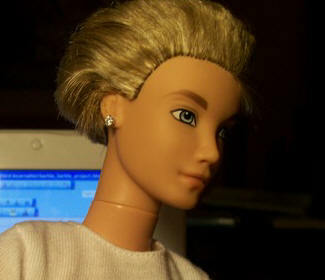 Yes, the problem is that I'm trying to do it for free--unfortunately, the Barbie Barbie budget is not very large. Maybe after Christmas I'll treat myself to some software that does it properly. Suggestions welcome. Monday, Monday. For the first several weeks, Barbie Barbie appeared on Podium Cafe on Mondays. I initially picked that day because Gavia has an awesome entertainment feature, the Wednesday Session, utterly filled with gossip and fun. Naturally, I can't compete with that. But "Wednesday" is a flexible thing, and the Sesh frequently appears on Thursday or Friday instead. I can't do Barbie Barbie on weekends because of family, so that left Monday or Tuesday. Then I missed Thanksgiving week completely, we got home and I had lots of catch up to do, and didn't get the next edition out until Thursday, December 3. I was going to try to get back on track Monday of this week, but again stuff intervened. And the Wednesday Session didn't appear until Thursday night, so here we are on Friday. Will I ever get back on schedule? Well...I'll try. Details. No major challenges this week. Pastries and coffee are Re-Ment miniatures. Furniture and supporting cast picked up mostly from garage sales, eBay, and Salvation Army. Who's who? The guy on the left with the bright jacket is an unknown Ken from fairly recent days; chick in pink with camera is a ballerina Teresa but not sure which; guy with black microphone the same My Scene River who was taking pictures in Second is the First Loser (who is not the My Scene River who became Benna--you'll be tested on this later); guy at counter is the Happy Family Alan who famously knocked up Midge a few years ago; woman in suit with long blonde hair is Working Woman Barbie; guy with short black hair and earring on right is a Flavas Liam whose hair got dyed before I got him (another Liam with his original blond hair played Ricco a few weeks back). 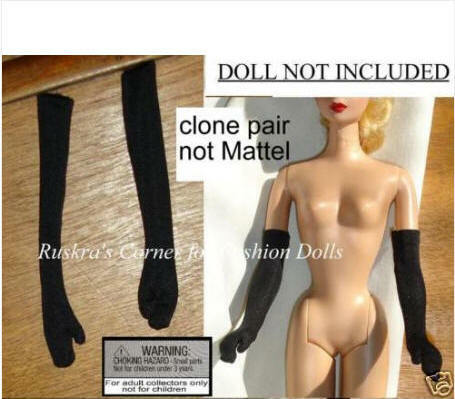 Disclaimer: Barbie Barbie is a private, non-commercial art project that is not in any way associated with or approved by Mattel, Cervelo Test Team, or Heinrich Haussler. No copyright infringement is intended and no money is changing hands.